Covers for upholstered furniture are not only used to save the expensive upholstery. They help decorate the furniture and to fit harmoniously into any environment. Comfortable and beautiful cover does not necessarily buy an expensive store. They can be made with your own hands. Select fabric to create furniture covers. Most often for the manufacture of covers used tapestry, velvet and flock. These materials are cheap, besides, they are diverse in textures and colors. As for color, you can choose one of the universal colors – brown or gray, which are the least easily soiled. 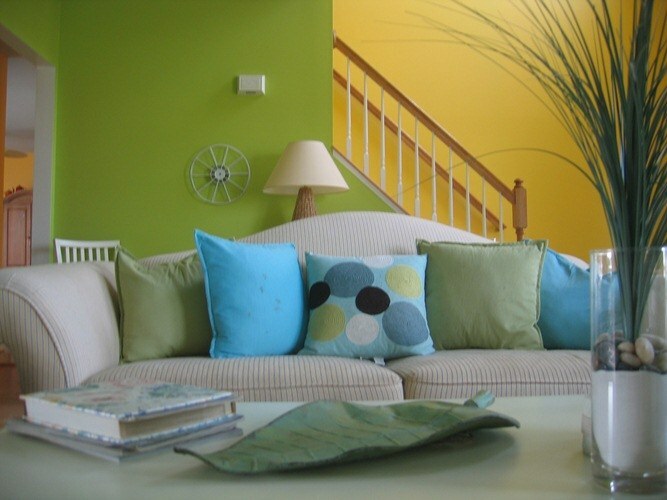 Of course, you should consider the color scheme of the interior. Exactly cover one of the parts of the furniture (armrest or back) muslin or other cloth patterns. Draw with colored chalk all the places of bends. Or finely baste stitch the original pattern details cover. Again try the pattern, correct wrong place. Make patterns for all the furniture the same way. Cut the pattern pieces of muslin and pin them to the upholstery fabric to be used for sewing slipcovers. Take the details of the case from the upholstery fabric. Connect details of the case, using a strong thread. You can strengthen seams edging. Vsheyte zipper in the seams on the back side of the back cover. Create covers for furniture with a concave or convex back provides a particular challenge. Need to partially or completely cover a back with a material to create a smooth surface, and then sewing the cover. Covers for upholstered furniture constantly shifted. To prevent this from happening, from the inside, you can sew a strip of fabric that will be hidden under a flounce. Under the strip you want to skip the paper clip or the pins that connect the case with upholstery. The length of the strips should equal the circumference of the piece of furniture on the upper edge of the Assembly.